Members of Congress are looking to create an encryption commission that would “get the answers we need” on the issue of encryption and digital security. 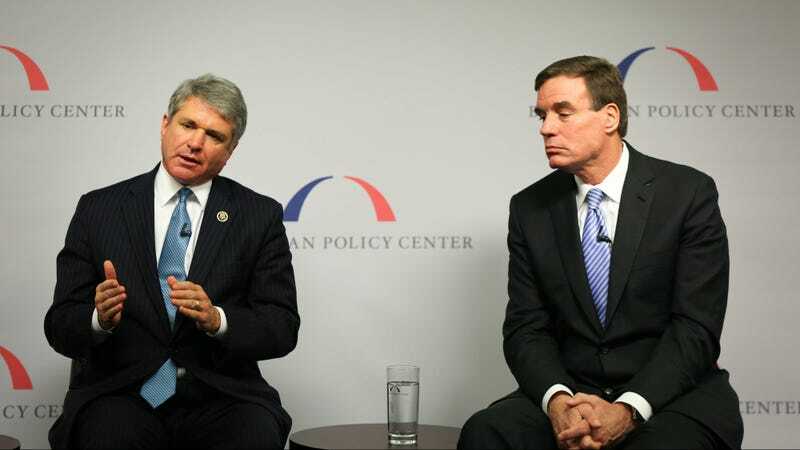 In an act of bipartisan showmanship, Senator Mark Warner and Chairman of the House Homeland Security Committee Michael McCaul are seeking to create a commission that would waste time and money all while providing no new revelatory answers on encryption, and certainly wouldn’t change anybody’s mind. Announced earlier this year, McCaul said the 16 member commission would work similarly to the 9/11 commission, which issued recommendations on how to stop future terror attacks. Homeland Security aides told reporters yesterday that they are hopeful the bill proposing a commission would be marked up by the Senate Homeland Security Committee when the next Congressional session begins in September. We already know how encryption works, how it’s deployed, and its pros and cons with regards to law enforcement operations. All the questions someone could possibly have about encryption have already been answered, and have been for years. Back in the early 2000's, the government had this same debate over encryption, and the technical experts of that era exposed the flaws of trying to ban or weaken encryption. It’s tough to imagine a world where the findings of this commission would change the hearts and minds of our blissfully ignorant representatives. It’s not like the concept of encryption has changed either. It’s a mathematical algorithm that scrambles data—be it messages, files, pictures—and makes them readable only to the intended recipient or someone with the encryption password. The only change that has occurred with encryption is that it has become much more reliable and widespread. Which is a good thing. I really doubt someone like McCaul, who wrongly blamed last year’s Paris attacks on encryption, would suddenly realize that encryption is a useful tool that can protect enterprises and citizens alike. There is no way this commission, which will most likely result in the same answers we’ve heard time and time again, would convince Senator Feinstein and Senator Burr that their nightmare encryption bill was a bad idea. This proposed commission is another way for lawmakers to drag their feet on actually passing meaningful legislation that would help protect folks like you and me in the digital age. A bill that would require our sensitive data that is stored on government servers to be encrypted, or one that explicitly bans forcing tech companies to create dangerous encryption backdoors for law enforcement, wold be much more useful than this proposed commission. Here’s the reality: Encryption is not going away, so it would be a good idea to adopt it and reap the rewards. It would be in everybody’s benefit if Congress embraced encryption, instead of wasting time and money on a commission that will tell us what we already know.